Unlike our American neighbours, Canadians aren’t always the most enthusiastic to create mythologies from our own history. 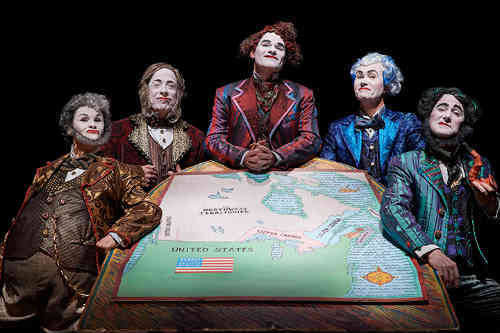 Which is what makes VideoCabaret’s Confederation series, presented in association with Soulpepper, all the more magical. Whether you’re well versed in Michael Hollingsworth’s cycle of plays known as The History of the Village of the Small Huts, or completely new to the experience, the segment of Canada’s history depicted in Confederation Part II: Scandal & Rebellion, will refresh your view on how Canada was made. I found myself in the latter category, uncertain of what to expect aside from a retelling of Canada’s first years as a nation. I wasn’t prepared for the Tim Burton-esque visuals and dark humor underlying the tale of our first Prime Minister Sir John A. MacDonald’s quest to build the Canadian Pacific Railway and link the nation’s feuding ethnic groups. Or drink a lot of demon rum. His priorities seemed equally balanced. My guest had seen several of VideoCabaret‘s earlier History Plays at the Cameron House, which she described as “the most mind-blowing theatre I’d seen.” She said the Soulpepper version felt true to the original, but in a more expansive setting where the larger stage provides greater opportunity to showcase the action of Canada’s rebellious early years. Despite the historical context, Confederation II is a convincing metaphor for the contemporary political scene, what with its emphasis on trade tariffs, ethnic divides, and shaky sense of what constitutes the Canadian identity, aside from our acceptance of a multitude of cultures. In Canada’s fourth election, Sir John A. MacDonald, recently ousted after a series of scandals including bribery and the loss of a parliamentary confidence vote, attempts to win back the Prime Minister role from the morally pristine prohibitionist Alexander Mackenzie. MacDonald asks voters, “Who do you prefer, Alexander Mackenzie sober or John A. drunk?” If you can predict the answer to this question, you likely weren’t surprised by how the last US election turned out. The production is like a finely tuned comedic machine, involving 3,000 stage cues, or roughly ten times the number in a standard feature production. The short scenes play more like quick-edited film than tightly choreographed stage work. The cast is universally stellar, with eight actors each playing no fewer than five and as many as a dozen separate roles. A quick wig, costume, and moustache change and the actors reappeared with an entirely new accent, worldview, and comedic timing. Highlights included Richard Clarkin as the charmingly creepy Sir John A., as well as Michaela Washburn as the endearingly unhinged Louis Riel and Kat Lewin as the portentous Plains Cree Chief Big Bear. Heavy stylized makeup allowed the actors to switch between gender, age, and ethnicity. Linda Prystawaska was particularly engaging to watch transform from a sultry French mistress to a prim English wife to a spunky young male Métis rebel, and then back again. The multiple casting and unrelenting humour reinforces the idea that although Canada’s history is often told through the voice of those best positioned to be heard, all participants had their own agendas and flawed sense of morality. And if Canadians can be united by our differences, then that bond is strengthened when we can sit together and laugh at them. Showtimes are at 8 pm with 2 pm matinees on Wednesdays. Ticket prices range from $25 – $60, with rush tickets available one hour before curtain. Tickets are available online or through the box office at 416-866-8666.